The iron-oxygen system has been at the foundation of our understanding of oxidation. As such, the study of iron oxides is crucial for problems ranging from corrosion in materials science to controlling redox equilibria in geology, which in turn affect the speciation of fluid phases, chemical differentiation, melting behavior, and other important physical properties in the Earth. Until recently, iron oxides were assumed to comprise only the polymorphs of FeO, Fe3O4, and Fe2O3. Combining synthesis at high pressure and temperature with micro-diffraction mapping at HPCAT, Yue Meng (Carnegie) and Barbara Lavina (University of Nevada - Las Vegas) have identified yet another distinct iron oxide, Fe5O6. The new compound, which has an orthorhombic structurem (Fig. 1), was obtained in the pressure range from 10 to 20 GPa upon laser heating mixtures of iron and hematite at ~2000 K, and is recoverable to ambient conditions. 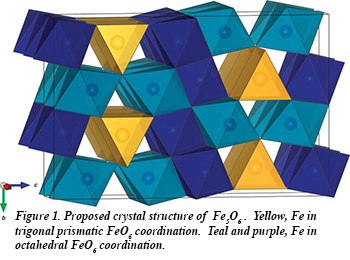 The high-pressure orthorhombic iron oxides Fe5O6, Fe4O5, and h-Fe3O4 display similar iron coordination geometries and structural arrangements, and exhibit similar compressibilities and variations in crystallographic parameters with pressure. Fe5O6, along with FeO and Fe4O5, is a potentially important minor phase in terrestrial planetary interiors and is therefore of major petrological and geochemical importance. The discovery of another iron oxide phase in a narrow compositional range adds new complexity to the Fe-O system [B. Lavina and Y. Meng, Sci. Adv. 1, e1400260 (2015)].